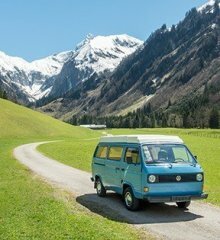 Providing tips and advice for campervan holidays in the UK. There are an abundance of designated stopover points which offer free overnight stays for owners of campervans and motorhomes, many of which are at authentic locations such as vineyards and country inns. These are available via several community-driven schemes such as Brit Stop, Camper and Caravanning Club and UK Motorhomes. Alternatively, you can experience wild camping if you are in a suitable region. However, please make sure that you are out of the way of any local traffic, residents and if applicable, livestock. Keep in mind that even though it's mostly tolerated if done sensibly, the landowner has the right to request you to move from their land. As versatile as a campervan is, it's understandable if you require extra facilities from time to time, such as hot showers, internet and laundry. You can book for a night at a campsite to take advantage of their facilities (but first research to ensure that they offer the facility you want! ), or visit a local swimming pool for a spot of leisurely paddle.